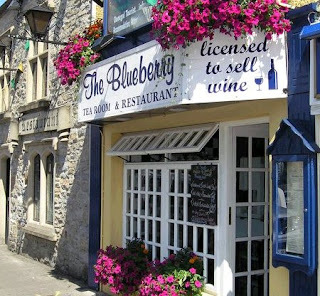 Ruperta Gallagher returned, with her husband Brian, from America in 1993 and opened the Blueberry Tearooms in Donegal Town. 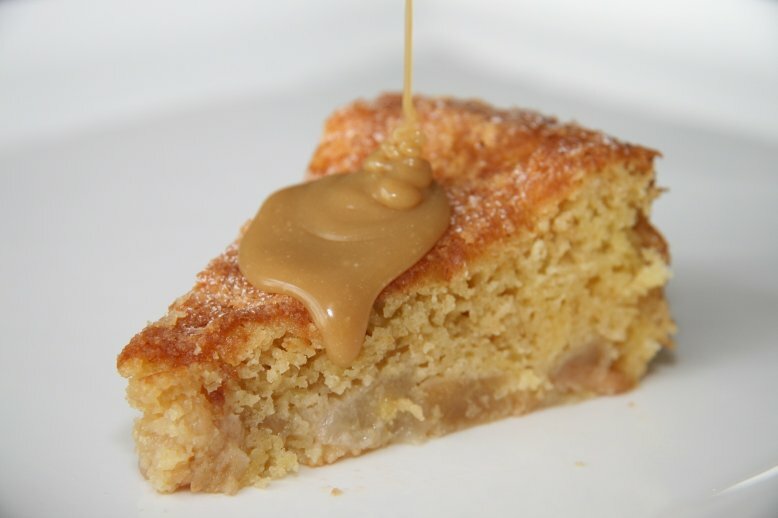 She loves baking tasty pies & tarts and this recipe, from her kitchen, is one of her favourite homemade Autumn cakes. 1. Set the oven at 160*C. Melt 40g butter, dark sugar & cinnamon together slowly in a shallow pan, stirring often. Carefully add the peeled, cored and roughly chopped pears and cook until tender and coated in sauce. Don't let the sauce go dark. Set aside to cool. 2. Beat the 200g butter and sugar until light & creamy. Add the eggs and flour alternately and fold in any remaining flour with the baking powder. 3. Add the pears and their syrup and mix gently. Pour into a 24cm loose-bottomed and lightly-buttered cake tin and bake for 45 mins. Leave to cool before removing from the tin. For the Fudge Sauce bring 100g muscovado sugar, 100g golden syrup & 50g butter to the boil in a heavy-based pot. Stir in 150ml cream and a few drops of vanilla extract and leave it to cool & thicken. Serve over the cake with some ice cream. from Derry using free social media. I (of course) am helping to promote the Donegal film "Brighter Days" !!! under which about 20 short films have been produced in the past 2 years. Please share this film by copying & pasting This link: http://youtu.be/gC_T6y9Oy9U and do Share it with your real friends! And Don't forget to Feed the Fish at the bottom of this Post! 2013 BLAA GOOD-NEWS UPDATE AT THE BOTTOM OF THIS POST! 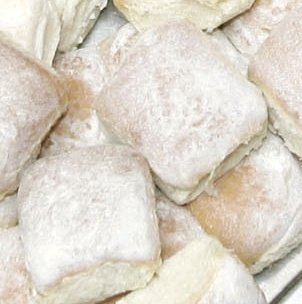 The Irish government has begun the formal process to seek EU recognition of the unique characteristics of the Waterford 'Blaa' - the simple, but special, bread roll/bap that is associated with Waterford City. 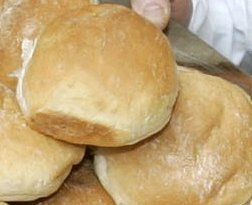 Minister Simon Coveney launched a national consultation process on the application of the “Waterford Blaa” for registration as a Protected Geographical Indication (PGI). On completion of the national consultation the application will be forwarded to the European Commission for review. 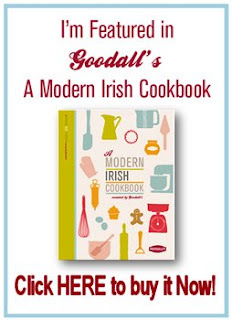 Granting of this intellectual property protection to "Waterford Blaa" would mean that producers of the product within the specified region only could use this name. 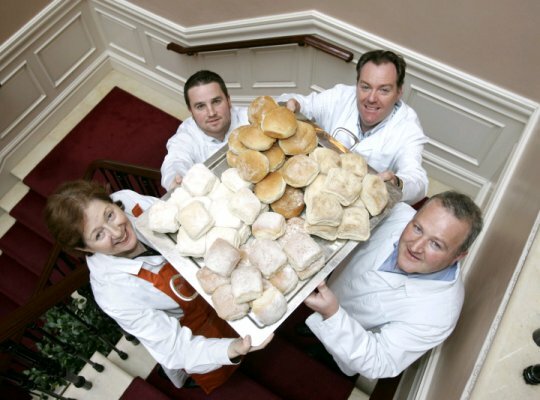 Minister Coveney said "The publishing of the specification document follows a period of engagement between the producer group in Waterford (Waterford Blaa Bakers Association) and my Department." 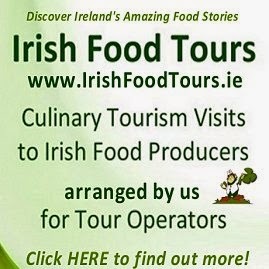 He went on to say, "It is important that we take advantage of the EU Quality Products Scheme; to date Ireland has not sufficiently exploited this opportunity, this is a positive step forward, I would encourage producers of regional products to discuss possible applications with my Department". 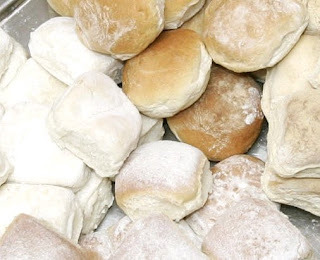 “Waterford Blaa” / “Blaa” is a soft doughy white bread roll clearly identified by the white floury top on the product. Unlike other products in this category Waterford Blaa contains no enrichment and is made from preservative free strong bakers flour, table salt, compressed yeast, dough conditioner and water only. 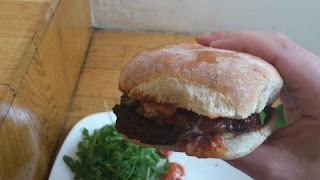 “Waterford Blaa” / “Blaa” can be round or square. They are made both crusty and soft are pined out round and trayed up round but the batch together as they expand during baking, when they are pulled apart they are square shaped but their domed top gives them a round appearance. “Waterford Blaa” / “Blaa” is 3-4.5cm high with a diameter of 8-12cm and weighs 40-65g. Rustic square, or round shape of bread with a dome shaped, crusty top dusted with flour. Crunchy at first bite, then chewy with a subtle malt taste and a pleasing bitter aftertaste from the well cooked, dark crust. 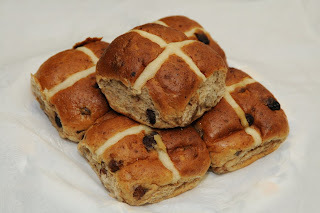 Soft, well-defined square, oval or round shape of bread, pale in colour and heavily dusted with flour. Slightly sweet, malt flavour, light but firm in texture and melts in the mouth. 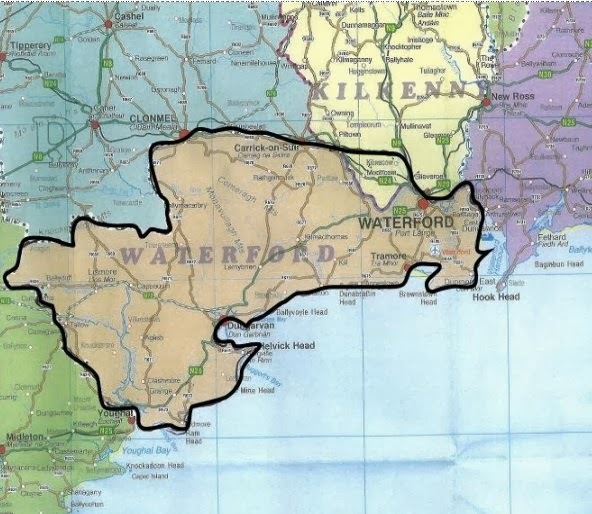 The geographical area that applies to this application is described as Waterford city and county and an area of south Co. Kilkenny as outlined in the map. 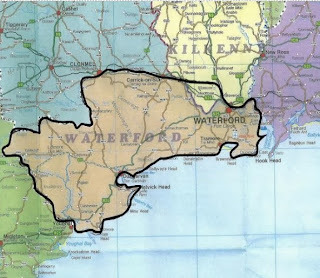 The geographical area is restricted to the geographical area known as all of County Waterford and that part of South County Kilkenny, which directly adjoins County Waterford made up of the Ullid and Dunkitt electoral divisions which is part of the southern Piltown electoral area The river Blackwater runs through the area and includes the town-lands of Dangan, Narabawn, Moolum, Newtown, Skeard, Greenvilleand and Ullid. You can read the actual Technical Specification Document for the Protected Geographical Indication (PGI status) of the Waterford Blaa HERE. The PGI scheme protects particular product names that are linked to a particular territory or to a production method. The products themselves do not have to be unique, yet the applications must show how the characteristics of the region - topographic, reputation, natural resources - have an impact on the characteristics of the product. At least one stage of production, processing and preparation of the agricultural product or foodstuff takes place within the defined geographical area. It is a stringent process and can take several years to complete from the time a decision to apply for the registration of a product is made. After analysis by national authorities it goes to Europe for consideration. Once it gets to European level the Blaa will undergo examination by the Commission services & publication with a 6-month opposition period before registration may be granted. Clare Island Salmon, Connemara Hill Lamb, Imokilly Regato, and Timoleague Brown Pudding. These products were worth €35 million to the Irish economy in 2010 and have a strong track record in the export market. 12% of Irish products bearing EU quality labels are sold within the Irish market, 82% are sold to other EU countries, and 6% are sold outside of the EU. In the EU as a whole the opposite is the case, as the vast majority of quality label products are sold within their country of production. This difference reflects the strong export-oriented nature of Ireland's food production industry. After over two years of consultation, the Waterford Blaa/The Blaa has, this week, received Protected Geographical Indication (PGI status) and is now a "protected food species". The Blaa was one of five new quality farm products added to the European Register of Protected Designations of Origin (PDOs) and Protected Geographical Indications (PGI), this week. The other foods indocturned into this European Food Hall of Fame were for a French goat’s cheese Rigotte de Condrieu (PDO); Italian cheeses Puzzone di Moena/Spretz Tzaorì (PDO) and Pecorino di Picinisco (PDO) and for a Slovenian soft cheese Mohant (PDO). 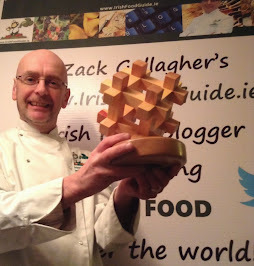 Congratulations ans well done to the Waterford Blaa Bakers Association and the Department of Agriculture in their long struggle to get recognition for this unique bread product. 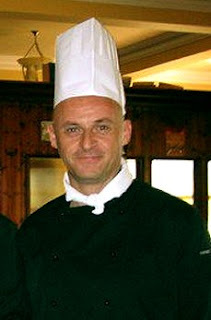 Dave Houraghan is the Head Chef at Woodhill House in Ardara. 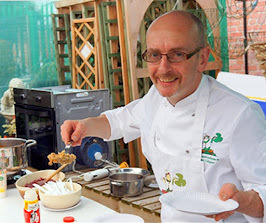 His cooking style is traditional French cuisine with a modern Irish twist and insists on using fresh Irish produce, especially fish & seafood from nearby Killybegs and Donegal-produced beef, lamb & pork. Woodhill House is an historic coastal manor house dating back in parts to the 17th century and formerly the family home of the Nesbitts, local landlords and Ireland's last commercial whaling family of the 19th century. The 6th century religious relic, St. Conal's Bell, was mysteriously stolen from Woodhill House in 1845 and has never been recovered. The house which overlooks the beautiful Donegal Highlands is set in its own grounds with an old walled garden. It is half a mile from the sea and a quarter of a mile from the coastal town of Ardara. "I love this time of year" says Dave. " It's a great time of year to go foraging for wild mushrooms in the woods around Ardara". 1. Slice the French stick horizontally and toast on both sides, leave aside to cool. 2. Melt half the butter in a frying pan and fry the mushrooms, when done set aside and keep warm. 3. Meanwhile slice the kidney lengthways but not all the way through, open like a book. Add the paprika to the flour and season with salt and pepper. 4. Dust the sliced kidney with the flour ensuring a good covering. Melt the remaining butter in the frying pan and fry the kidney for 2 minutes turning regularly. 5. Reintroduce the mushrooms for 30 seconds and mix with the kidney. Remove from the pan and cover to keep warm. 6. Toss the flour we used into the pan with the juices and stir well. Cook for 30 seconds, add the brandy and red wine. bring to the boil and reduce by half. Season to taste. 7. 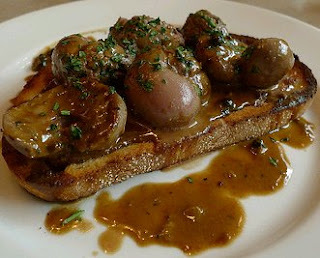 Butter the toast then spoon over the ingredients, drizzle the sauce over the top and garnish with torn parsley before serving. Duck is a very popular meat on the menu of many restaurants in Ireland today. It is a tasty alternative to chicken and at this time of year it is an introductory step for conservative eaters, to all of the wonderful Game meats that are now coming into season over the winter months. 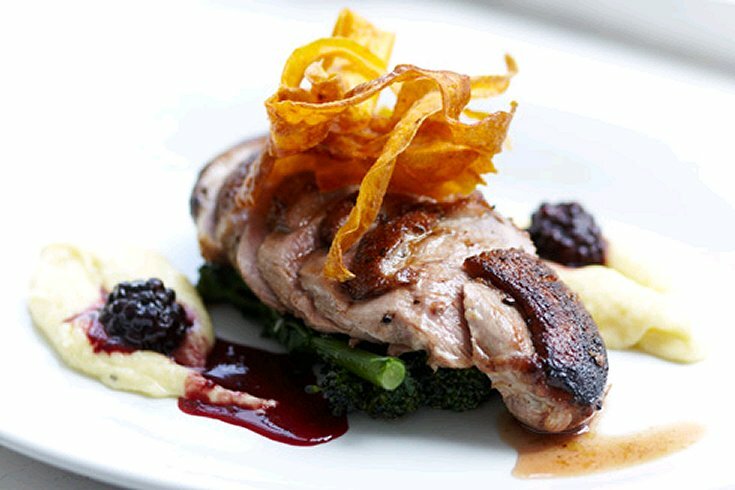 Duck, especially if you can get wild duck, will open your taste buds to a whole new range of delicious meats like pheasant, quail, Pigeon, Grouse and even Rabbit! 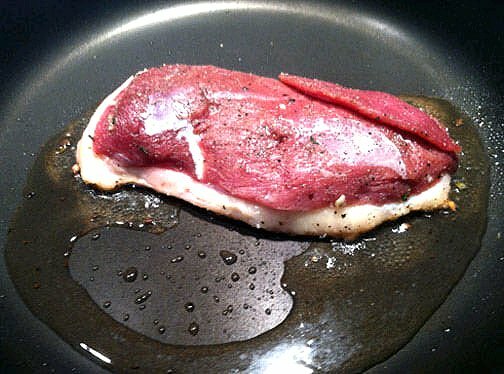 The secret to cooking a duck breast lies in dealing with the quite large amount of fat in the skin, but without ruining the meat. To address this simply pour off the fat after you seal the skin-side, leaving a beautifully delicious and crispy skin, before you turn the breast to seal the other side. Keep this fat, as it is delicious for roasting potatoes and will keep for weeks in a jar in the fridge. I recommend that you treat your duck breast as you would a steak and cook it to the same degree that you would eat a steak- I like mine just shy of medium - but please don’t over-cook your meat! 2. Bring the red wine to the boil and reduce by two thirds. Add liquid stock and reduce by half, add the cranberry sauce and simmer for approximately 10-15 minutes. Stir in 1 teaspoon butter (this will give your sauce a wonderful shine and extra flavour) and season to your taste. 3. Trim the sinew off the meaty side of the duck breast and score the skin with a sharp knife. Rub a little salt and black pepper into the skin, this will also help to make it even crispier. 4. Prepare the parsnip purée by peeling the parsnips and cutting them into chunks. Boil in salted water, cooking until tender. Drain and add a little butter & white pepper. Mash until smooth. If you wish you can use a hand blender to make the puree very smooth like you would get in a restaurant. Keep it hot under a lid. 5. I like to serve a little broccoli with this dish and I would steam the broccoli now, over the parsnips while they are cooking. Keep the broccoli hot under a little tin foil. 6. Heat a heavy metal frying pan but do not put any oil or butter on it. Place the duck breast on the hot pan skin side down. Cook for 2 minutes until crisp and golden brown. Gently pour off the fat and turn the breasts to seal in the other side for another minute. 7. Transfer the pan to the oven (or place the duck on a baking tray if your pan has a plastic handle) and cook for approximately another 6-8 minutes for medium. You can adjust this time depending on your preference. 8. Remove the duck breasts from the oven and cover with a dry cloth to let them rest for 3 or 4 minutes. When you cook any meat, it is essential to let it rest for a little bit before you carve it. This ensures that all the juices that are under pressure during the cooking are redistributed throughout the whole piece. As a result, less juice runs out of the meat when you cut into it. 9. To serve, slice the duck breast and sit it on top of the broccoli. Garnish with the parsnip puree and cranberry gravy. 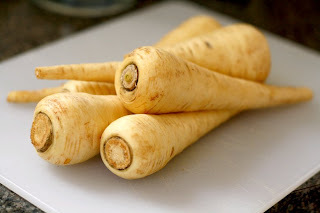 If you wish, you can take another peeled parsnip, cut it into thin strips with a veg peeler and drop into some hot oil, as you would when making chips. Take them out after 20 seconds just as they start to colour and dry on some kitchen paper. They will go crispy and you can arrange these on top of your duck for that extra special touch!